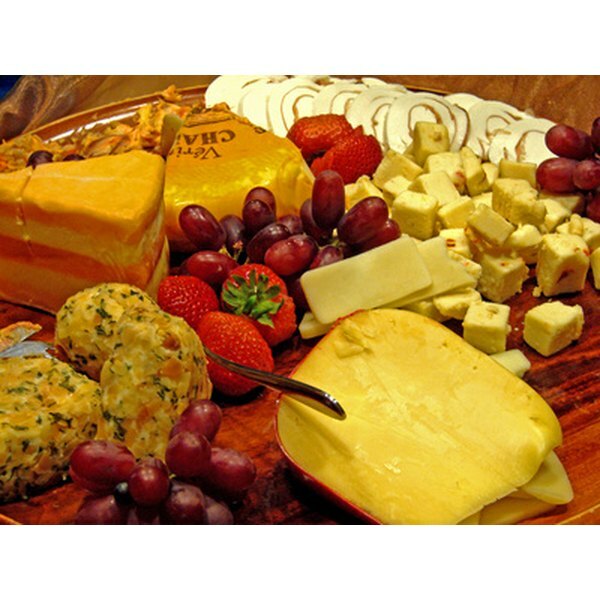 Impress your guests with an appetizing cheese tray. 2 Do You Thaw Frozen Cheese Before Grating It? Whether you’re hosting the party of the year or a small dinner with friends, cheese trays are a quick and tasty party food with minimal preparation and maintenance. By providing a variety of choices, interesting garnishes and an artful display, you can wow your guests and provide a delicious snack to complement their meal. Choose your cheese types according to when you’re serving them (i.e. as hors d'oeuvres or after dinner), how many people you’re serving, and the theme (if any). Select three types of cheeses with varying textures to offer variety without overwhelming your guests with choices: one hard and dry, one soft and moist and one with an in-between texture. Mix cheeses with mild and strong flavors as well as cheese from different types of milk (i.e. cow, goat and sheep). Add bread or crackers; fresh slices of bread and savory crackers complement the flavors of cheese. Provide breads with neutral flavors so they don’t overwhelm the flavors in the cheese and serve them on a separate plate so they don’t crowd the cheese tray. French and sourdough breads go well with a variety of flavors, as do wheat and butter crackers. Cut the cheeses and decide how you will arrange them in your display. You can cut into any shape -- such as wedges or cubes -- but make sure the sizes fit the bread and crackers. You can even get creative with cookie cutters with softer cheeses. Arrange the cheeses in sections on the tray; or, if you are serving a large group and have more cheese than will fit on one tray, prepare separate plates for each variety. Each cheese should have its own knife to ensure the flavors don’t mix. Add garnishes to enhance the quality of the assortment. Olives and fresh fruits such as strawberries, pineapples and apples are common; nuts and dried fruit also enhance the flavors of the cheese. Refrigerate the cheese until an hour before serving time; the cheese should reach room temperature by the time you serve it. Kelly Neal began writing arts and culture articles for various websites in 2010. She earned her dual Bachelor of Arts in English and music from The Ohio State University.